The ultimate road map for landing your dream job, packed with true inspiring stories from more than sixty people who made profound changes in their lives and careers, plus practical advice from experts. “If you are ready to go for the life and the job you really want, Take the Leap is the go-to book for anyone making a career change” (Bobbi Brown). 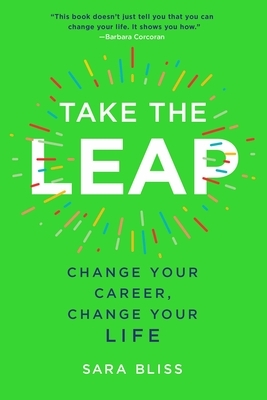 Take the Leap features inspiration and advice from game changers, rule breakers, and side hustlers who once stood where you are now, wondering if they should take a risk. They went from production assistant to million-dollar screenplay writer; attorney to surf instructor; mom to DJ; hairdresser to firefighter; real estate agent to award-winning chef. Do you want to go for that career you’ve always dreamed about? Launch a new company? Become a tech mogul? Live a life of adventure? Save the world? You’ll find wisdom from successful mentors like creative visionary and writer Simon Doonan, entrepreneur Barbara Corcoran, NFL player turned artist/activist Aaron Maybin, and wellness and beauty guru Bobbi Brown. Whether you watch Shark Tank religiously and think I could have thought of that, or harbor daydreams about traveling the globe in style, your wildest career dream is represented in this empowering guidebook. Take the Leap serves as the reminder we all need: don’t settle—go after whatever it is that you truly want.